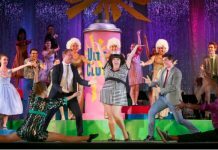 Patrick Pevehouse (center) plays Lumiere in the touring production of Beauty and the Beast. Photo by Matthew Murphy. Ryan Everett Wood and Patrick Pevehouse are living their dreams as the Beast and Lumiere in the touring production of the stage musical Beauty and the Beast, set to arrive in Vancouver in February. But it’s not easy stepping into such iconic shoes. Wood says he’s had to go deeper into the character of the Beast than he ever thought possible. 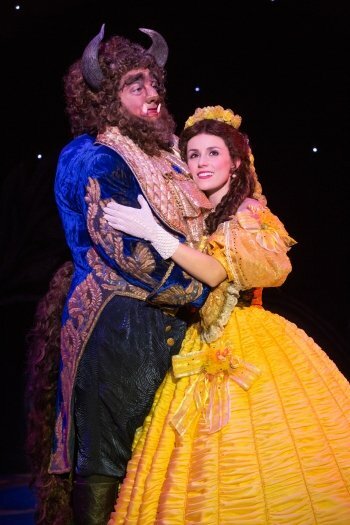 Ryan Everett Wood as Beast and Jillian Butterfield as Belle. Photo by Matthew Murphy. For Pevehouse the challenge was to find a way to pay his respects to the film’s beloved Lumiere and yet still bring something new to the character. Pevehouse and Wood are no strangers to the Disney musical. The first time they met was in a Toronto rehearsal room preparing to play Buzz Lightyear and Woody on a Disney Cruise Line production of Toy Story. But living aboard a Disney cruise ship, while an incredible experience, just doesn’t compete with life on tour. Beauty and the Beast plays the Queen Elizabeth Theatre (630 Hamilton St, Vancouver) February 3-8. Tickets are available online at Ticketmaster.ca or visit Broadway Across Canada for more information.